Israel’s leaders hold the country out as a democracy … just like the U.S.
Of course, America is officially no longer a democracy … as wealth is so concentrated that it has broken the political system. Lior Akerman – former Brigadier General and division head in the Shin Bet (Israel’s Security Agency) – writes in the Jerusalem Post that Israel has never been a democracy. Since last week, Israel has been governed by an oligarchy. These are self-styled lords of the manor who have power over civil and military sectors, and share the spoils of rule between themselves. The subjects can talk, but have no influence. Israel has been transformed from the only democracy in the region, to a democracy where power is held by only a few. Bloomberg noted in 2013 “Israelis rise up against the oligarchs“. A report from that committee singled out business groups that control both financial and non-financial companies. In November 2013, Israeli Prime Minister BenjaminNetanyahu criticized the high level of concentration in the economy. “The primary factor in the lack of competition in Israel is economic concentration fostered by cartels or the monopolistic behavior of wealthy individuals,” Netanyahu told the Israel Democracy Institute. The OECD has also singled out Israel’s concentration of wealth as a problem to be addressed. The oligarchs‘ immense power, and the inequality that accompanies their economic might, stands in sharp contrast to what some Americans believe about the Israeli economy. In the American imagination, Israel’s economy is a high-tech paradise. Books like Start-Up Nation: The Story of Israel’s Economic Miracle have cemented that image. At the other end, while the available data — puzzlingly — don’t show an especially large share of income going to the top 1 percent, there is an extreme concentration of wealth and power among a tiny group of people at the top. And I mean tiny. According to the Bank of Israel, roughly 20 families control companies that account for half the total value of Israel’s stock market. In short, the political economy of the promised land is now characterized by harshness at the bottom and at least soft corruption at the top. And many Israelis see Mr. Netanyahu as part of the problem. Israel’s economy and regulatory apparatus, which has become increasingly captured by special interest groups over the past two decades, enabled the rise of an Israelioligarchy comprising just ten pyramidal business groups, controlled by individuals or families – and affiliated professionals, such as accountants, lobbyists, lawyers, managers, consultants and other businessmen and business groups. 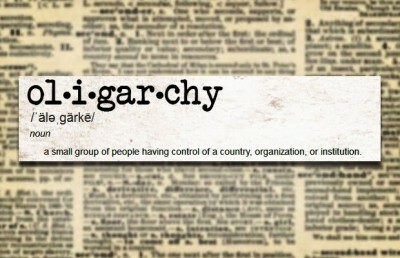 This oligarchy, whose power is embedded by the big banks, controls substantial shares of the market economy and the public’s financial assets, managing tight relations with state agents. It is further linked to other powerful monopolies in the public sector. And it’s not only Israel’s oligarchs who have skewed Israeli’s political system … it’s also Americanoligarchs.